Last week we had an exciting first round of the Tournament of Made-It-Myself. Some great projects were eliminated, but four great projects are in the semis. Today and tomorrow I’ll post those four projects, and you have until this Sunday at 2:00 CST to vote. Same voting rules from Round 1 apply here. On Sunday, the winners of Round 1 got an e-mail from me saying that this round would involve a different homemade project than their first submission. So these very talented people had to go find something else, and I think you’ll be impressed by what they’ve created. The entries were randomized for the semifinal matchups. Inspired by Pinterest, I made homemade ornaments with two of my nieces this year so they could have gifts for their parents and grandparents – but I also made some for myself :-). 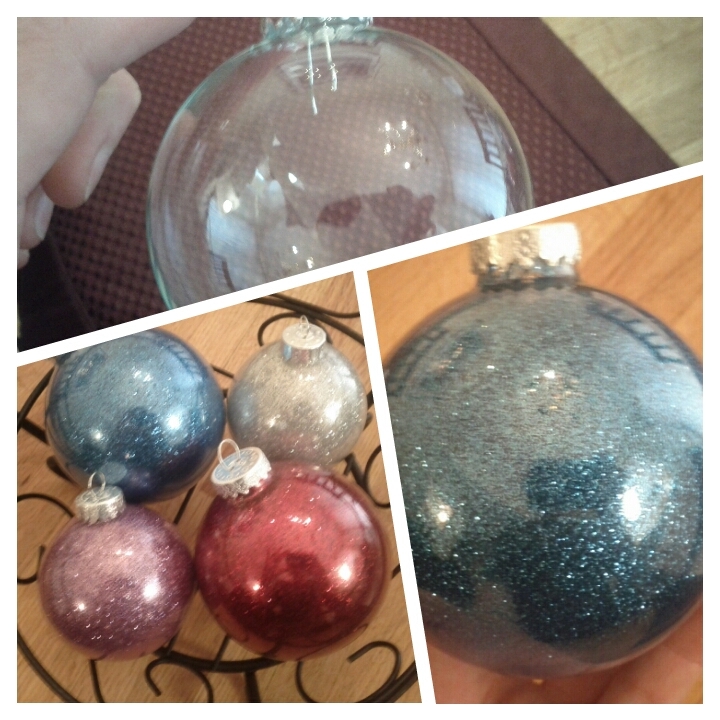 It involved using clear glass ornaments, floor polish, and fine glitter. The glitter is actually on the inside of the ornament and is held on place by the floor polish. The finished products turned out great and really shine on Christmas trees next to the lights. This project was also for a friend but is a bit more sobering. A long-time friend of mine was going through a rough patch. She is a single mom of 5 kids (ranging from kindergarten to high school) and just has a lot on her plate. I started spending time with this family when I began babysitting for them, right after they brought their second adopted child home. The kids and I are very close…really, I function more as a big sister now than a babysitter. Anyway, I really wanted my friend to have a good Mother’s Day, especially since I feel she is one of the best I’ve ever met. I took the kids to a popular photographic street in downtown Birmingham to take some pictures. I got several of the kids all together and then at least one good portrait of each kid alone, capturing their personality and vibrance. 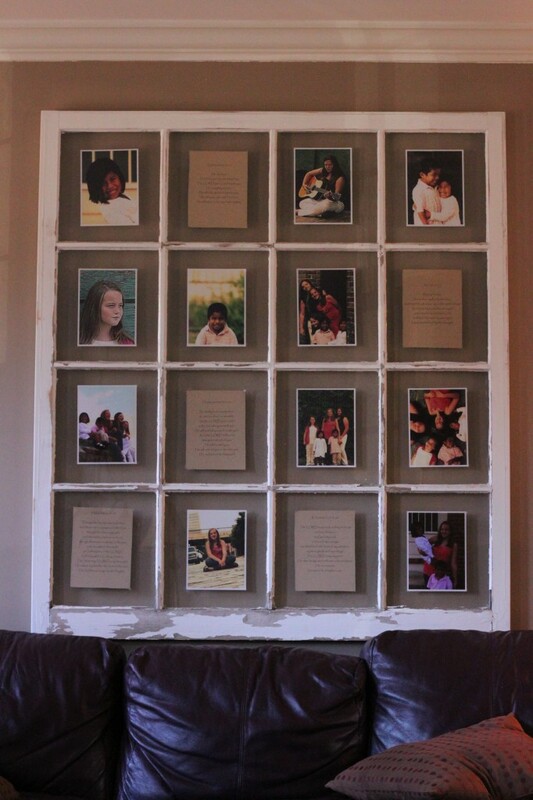 After I edited and printed out the pictures, I used an old window from my parent’s house as the “frame”. I sanded, distressed and painted the frame to give it that “shabby chic” look. I also printed out several Bible verses I knew my friend cherishes. I placed the pictures and verses in the window panes and the kids gave it to her for Mother’s Day. Right now, it’s hanging in the family room and I hope it brings as much happiness to her when she sees it as it did for me to create it. This entry was posted on Thursday, February 28th, 2013 at 12:10 am	and is filed under contests, poll and tagged with Tournament of Made-It-Myself. You can follow any responses to this entry through the RSS 2.0 feed.